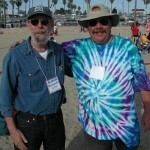 Most kite fliers know about the Internet-based Kite Classified Page (link at end of article) but very few know the face and the story behind the web site, who runs it, why and what their affiliation is with kiting. All that is about to change. Meet Charly Whitaker. About as unassuming a man as you’ll ever meet, Charly is that rare breed of individual who accepts people at face value, on their own terms and for what they are. He seems to have that singularly human trait that makes him give of himself, his time, his efforts, his energy and the money right out of his own pockets without so much as a ‘thank you’ or a single glance back. He’s a man on a mission and that mission is kiting. As a young boy, Charly made kites out of dry cleaners bags (the kind they stuff dresses and suits into) and used to fly them off the top of a hill by the elementary school he attended. Even though those bags were pink, it was still the best material he could find and when one would fly out over the Columbia River, well, it didn’t seem to matter much WHAT color they were. As a Vietnam era veteran, he started riding motorcycles … REALLY fast … and found that adrenaline rush provided an escape that suited him well. However, the delayed reaction of post traumatic stress syndrome eventually caught up with Charly and brought him to a therapist who told him, frankly, “You’re nuts, Charly. Go fly a kite.” It was the therapist himself who told Charly about stunt kites. So, off he went on a 400 mile journey to buy his first set of kites. And the rest, as they say, is history. Having been intimately involved with both the “Kite Sport” and “Aerial Delights” kite shops, Charly has a vast knowledge of the technical as well as the aesthetic aspects of kites and how we humans interact with them. His affiliation with the “Washington State Head Injury Foundation”, and being a head-injury survivor himself, allows him to use kites to help teach hand and eye coordination and give lectures to physical therapists (on doing the same for their clients). Once again the therapeutic effects of flying kites finds a new application. 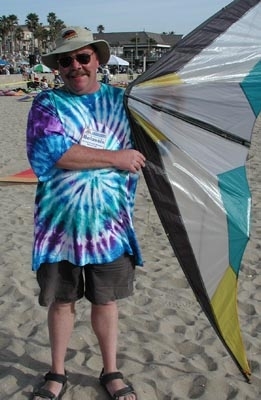 Charly eventually went on to form the “Kite Flying in the Pacific North West” Yahoo group, which ultimately led to his election as the president of the “Washington State Kiteflyers Association” in March of 2002. 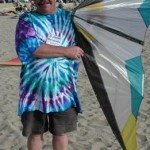 In January of 2003 he bought the “Kite Classifieds” web site from its original owner, Joe Love. Charly had been helping Joe as his moderator and when he found out he was going to sell the web site, he made arrangements to purchase it and promised Joe he would continue to run the site in the same way he had run it. He bought the site and took on his long time friend and fellow kiting buddy Dave Shattuck as a working partner, and the site continues to evolve and mature to this day. If you’re not familiar with the Kite Classified Page, it is a web site where we can buy (from other kite fliers) and sell kites. Charly doesn’t charge for this service but does accept PayPal donations to help defer the cost of maintaining the site as well as the bandwidth required to support it. This is a GREAT service that Charly provides and there is no way we could ever thank him enough for his tireless efforts. And there you have the abridged story of Charly Whitaker. 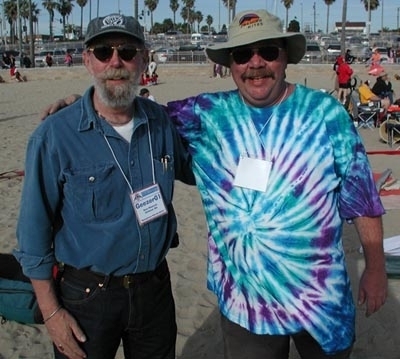 A kite flier and builder at heart who returned to kiting as a way to cope with stress and went on to support kite fliers in ways he never would have dreamed possible. I think we should all thank our lucky stars that Charly is involved in kiting and remember that there is ALWAYS a face and a person behind every web page. The next time you visit the Kite Classified Page, send Charly and email and tell him thanks. I know he’d appreciate it. This entry was posted in 2004, Issue 36 (May/Jun), KL Archive and tagged friends, people.